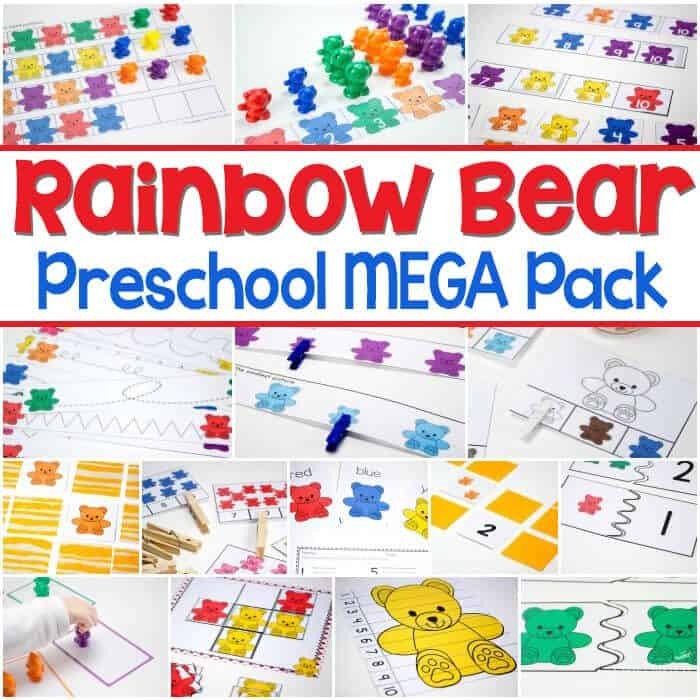 We love, love, love rainbow bears!! 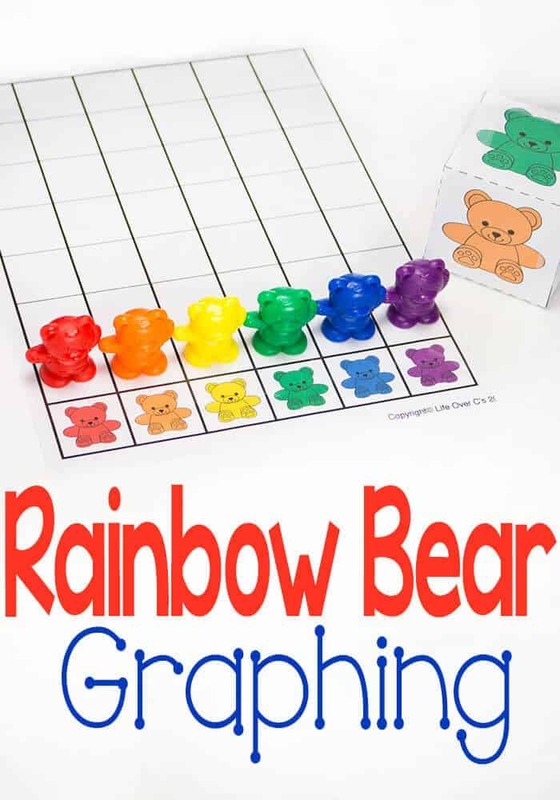 Every time we change out the activities on our shelves we have to have a new rainbow bear activity or two or three… This month will we have all sorts of rainbow bear fun, starting with this free printable rainbow bear graph activity for colors. 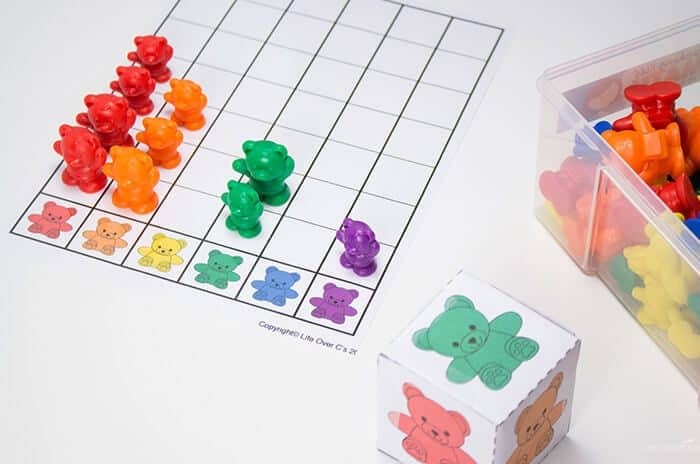 My daughter loved rolling the printable cube and finding the matching colored bears to put on the graph, so I’ll be making use of her enthusiasm to repeat this graphing activity a few times! It is totally optional to laminate, but I laminate everything that we plan to use more than once. Otherwise, it gets all creased and messy with my daughter’s excitement. I just placed an order for 400 more Scotch laminating pouches tonight, so that we can continue with our fun activities!! 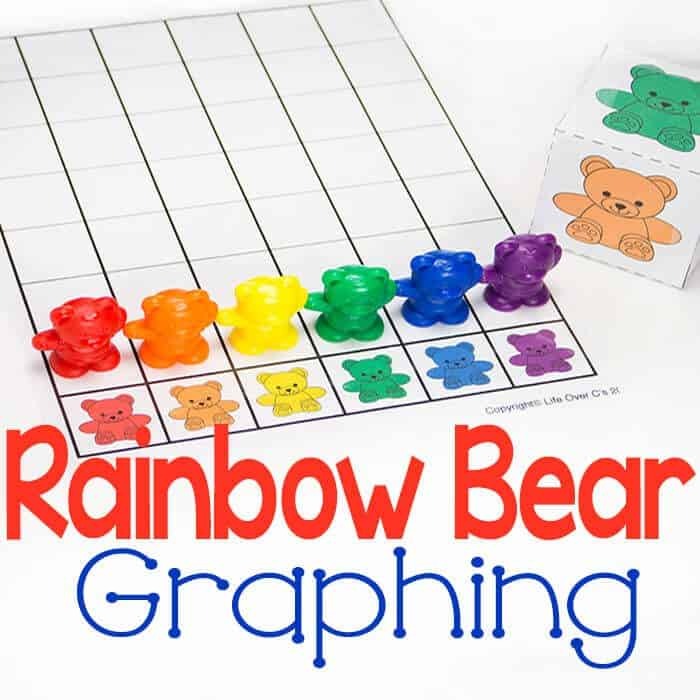 To prep: Print and laminate the rainbow bear graph page. 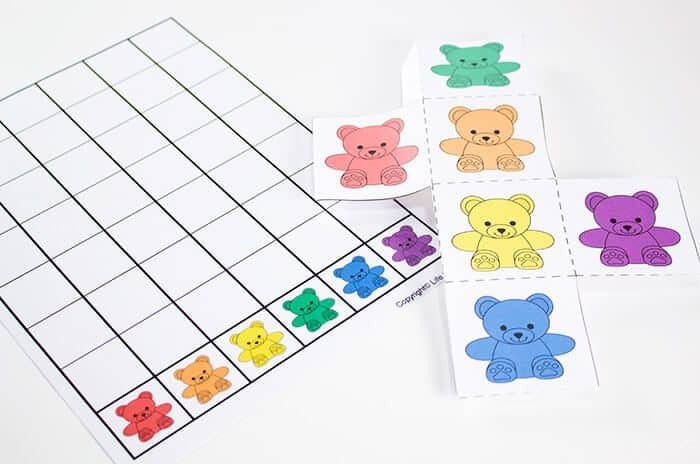 Print, cut out and assemble the rainbow bear cube. This easy prep is well worth your time once you see the excited look on the kids’ faces! To use: Roll the cube. 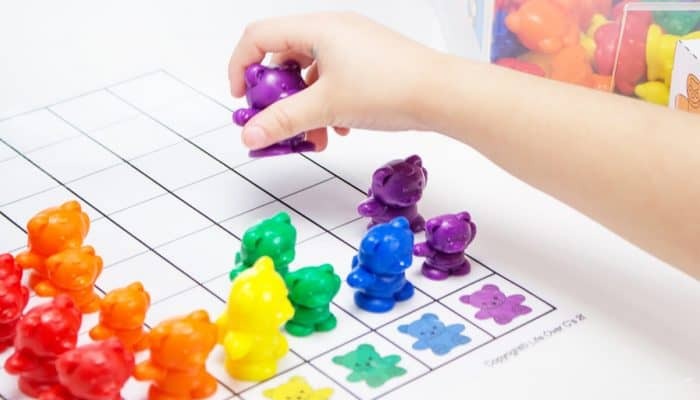 Add one rainbow bear with the matching color to the correct column on the graph. What does the graph look like after 12 rolls? How many rolls does it take to get one color to reach the top of the graph? If we use the graph more than one time, do we get the same results? With Shiloh, my main goal was to help her with color recognition and sorting into columns of the graph. You will be surprised at how easily kids can grasp the purpose of the columns on the graph! I didn’t have to explain to her more than to point out the colored bears on the bottom before we started the activity. We’re still working on color names, so I made sure to repeat the colors every time she rolled, picked up a bear, and placed a bear. What seems so silly and repetitious to us as adults is extremely important for language development. Kids need to hear words repeated, especially when they have a concrete object to refer to such as a rainbow bear. 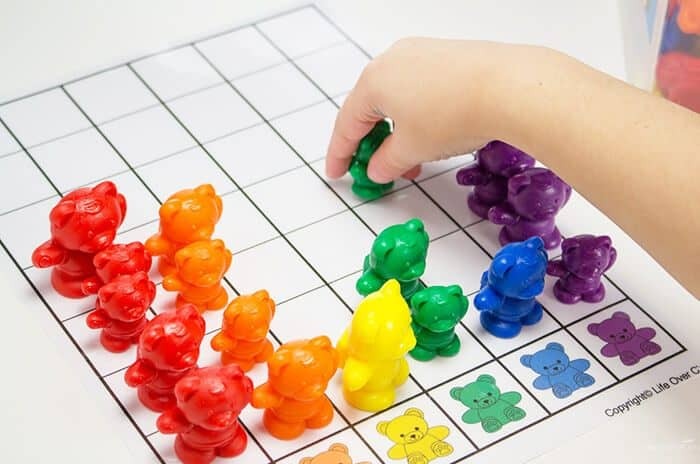 Take a picture of your children using the Rainbow Bear Graph and share it on Instagram with the hashtag #toolsforlearning to join in the Manipulative Challenge! All this year, we’re sharing ways to make learning fun and hands-on!